When I originally published the below post it mentioned that the time between this and my last post was only a very short time. In this re-publishing run it will be spread out over a longer period of time. So onwards with a modified version of the original posts. The previous post in this series got me thinking about the cons (and cost) of hiring minions. Now what could be the advantages of hiring/creating them? 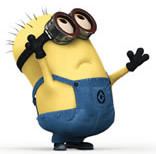 Take Exhibit A here – We shall call him, from now on, Dave Minion. It looks quite good. It has the correct number of arms, legs and eyes (always a good start but sometimes an extra limb or two can be an advantage). 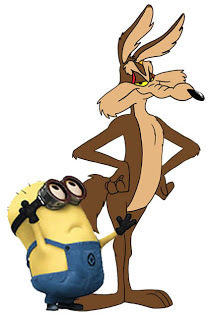 This minion looks like a good idea until you compare it to a classic evil genius and scientist. Now you can see the differences in height. This does have an advantage. You can stuff them into a space a lot smaller than one of average height. The downside is they do tend to eat a lot more than what you would expect. What Dave lacks in height he does excel in his lifting capacity. Need an anvil (all sizes), rocket launcher or even, your ever faithful, Doomsday Device moving from one area of the cave to another then Dave’s your man. You may think that you need more than just Dave. This may seem like a good idea until you look at what happens when you end up with too many. Rioting and accidental firing of heavy weapons … I’m looking at you Dave for this one. I will say that if you do have mass hordes of minions then the odd mistakenly fired rocket will not damage your work force. Cave, Volcano or self build?